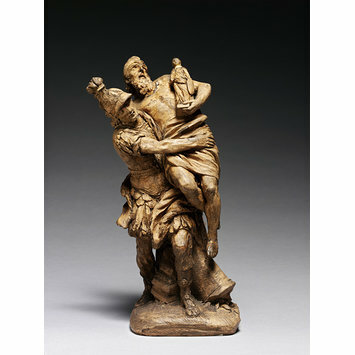 This terracotta depicts Aeneas carrying his elderly father Anchises, who is leading Aeneas' son Ascanius by the hand. In Greco-Roman mythology, Aeneas was a Trojan hero. After the city of Troy fell to the Greeks during the Trojan War and was burnt, he and his family fled to Italy (where his descendants founded Rome) and it is this dramatic moment which is shown in this terracotta. This was a popular subject in sculpture, also depicted for instance by Bernini, as well as in painting. 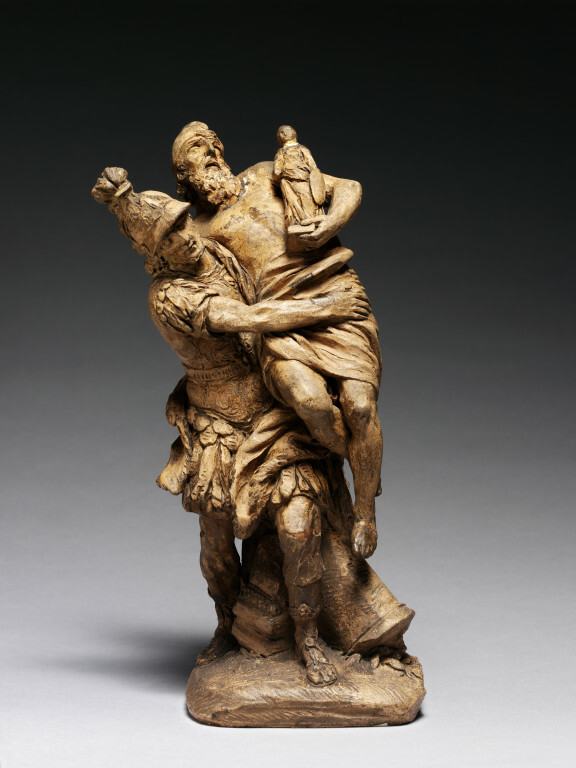 Anchises carries a household god of Troy, which he took with him to Italy. This terracotta model by Le Pautre, signed and dated 1715, is possibly a sketch model for a marble group of the same subject and composition now in the garden of the Tuileries (it was formerly at Marly, just outside Paris), one of many sculpures made for the King, Louis XIV. More recently it has been suggested that this is a cast from the original model in wax for the marble group. Many of these sculptures, including this one, show subjects from classical mythology which were popular with the King and in royal circles at the time. Le Pautre begun work on the marble group in Rome soon after 1691 while the artist was working at the Académie de France, but it was not finished until 1716 after his return to Paris. Aeneas, wearing classical armour, helmet, and a lion skin loosely draped around his hips, is carrying his father Anchises against his left side. Anchises holds the Penates in his left arm while with his right, hanging over Aeneas' back, he leads his grandson Ascanius. Terracotta model for the marble group now in the garden of the Tuileries, formerly at Marly. The marble group, which is signed Le Pautre fecit 1716, was begun in Rome soon after 1691 while the artist was working at the Académie de France, but it was not finished until 1716 after his return to Paris. This terracotta is closely related to a wax model for the marble group made by Girardon.